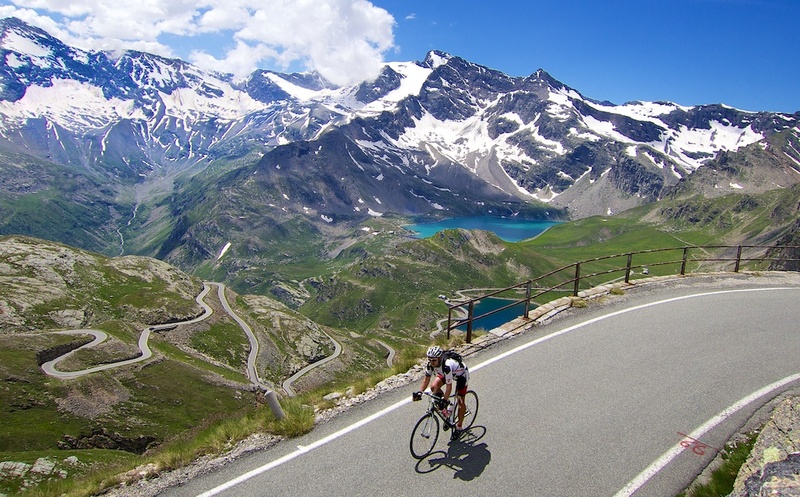 What is more beautiful than cycling in the high Alps? 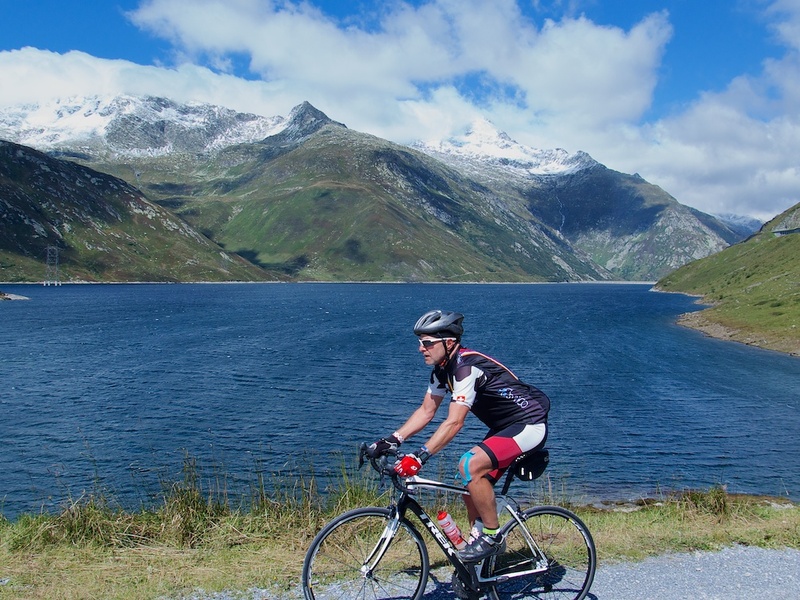 Cycling in the Alps up to an alpine lake! Here are 10 28 great cycling climbs up to alpine dams / lakes (map at bottom). A steep climb to a stunning location. 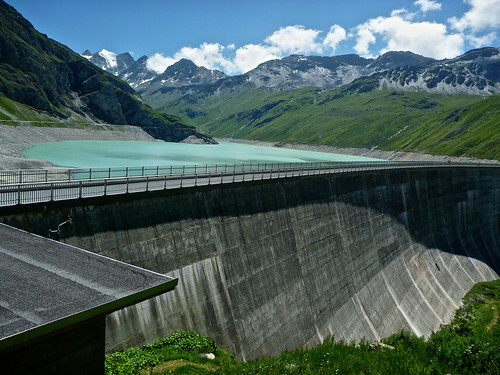 The first dam at Emosson was built in the 1920’s to supply electricity to the Swiss National Railway. Note, the 3rd photo above: there is a slightly insane road that is ride-able above the dam up to a smaller dam / lake above. Details from Chamonix here. Details via Martigny via Col de la Forclaz here. 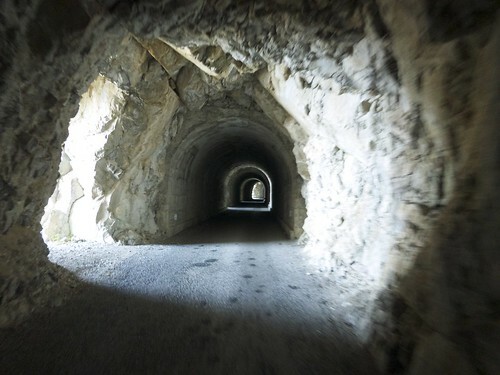 Finally, a third way via mountain bike that also includes taking the very scary tunnel to get to the far side of the lake – see here. 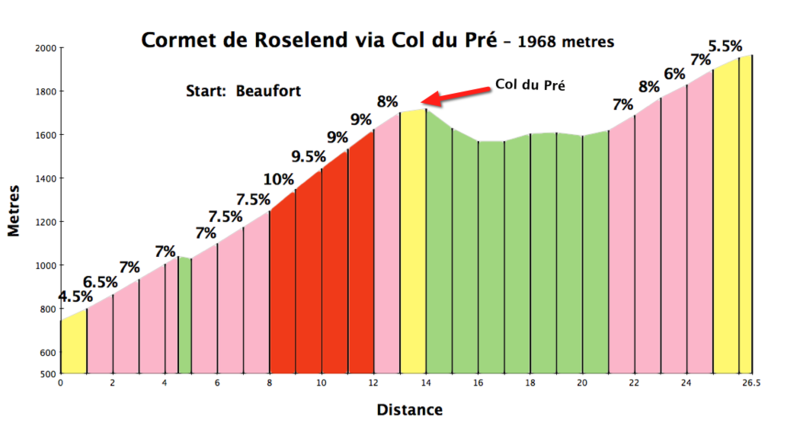 Above Beaufort, the route over Cormet de Roselend appears frequently in the Tour de France. 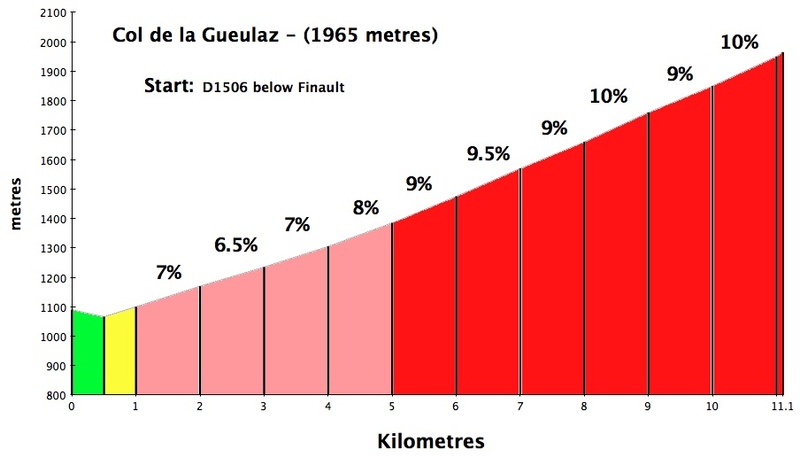 While there is a direct way up via Col du Meraillet, the better route is via the super steep Col du Pré. 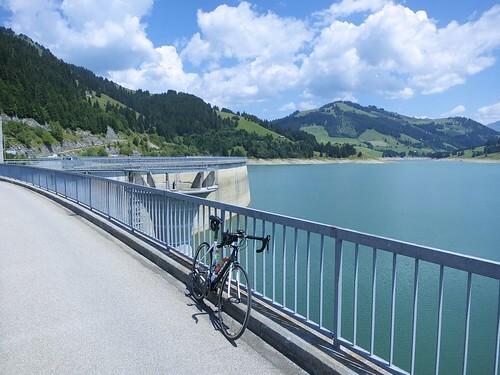 This allows superb views from above the Lake – as well as letting you ride over the dam itself on the way to Roselend. Remember the lake is several kilometres below the summit. Details of both sides here. 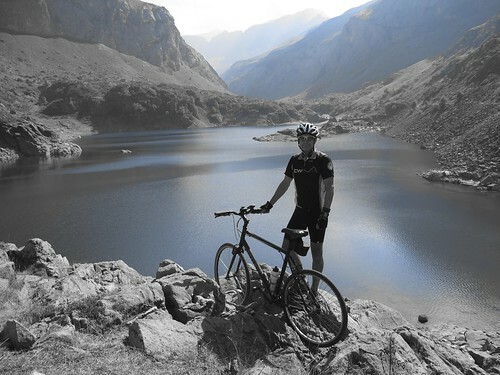 For a fantastic mountain bike route high above the lake, above 2000 metres, see here. 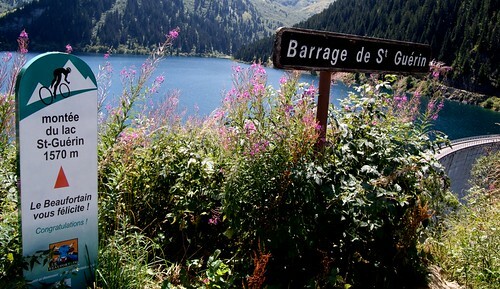 Finally, a route via Col du Pré, with a detour to another beautiful Alpine Lake/Dam: Lac de Saint Guérin. Details here. Perhaps the most beautiful final 15 kilometres that I have ever ridden. Seriously. 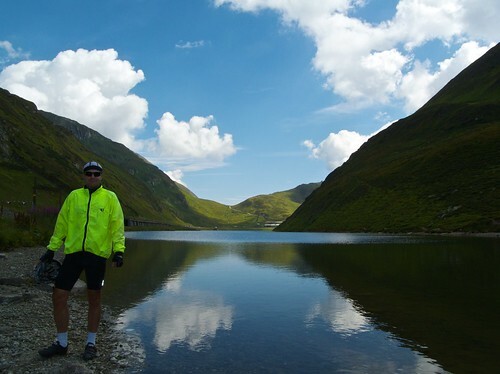 This very high Italian pass (2612 metres) along the French border in Piemonte has two big dams and several lakes. An amazing place. And every Sunday during the summer, the top several kilometres are closed to motorised traffic. Paradise. Details here. 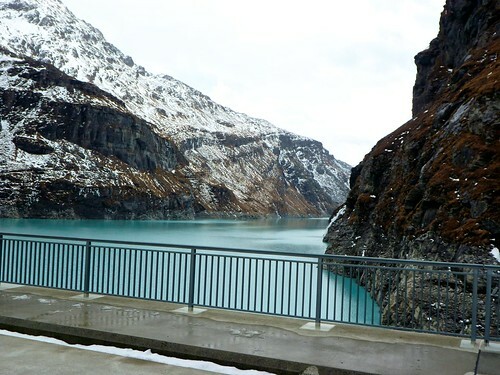 The biggest of the many alpine dams in the Valais region of Switzerland. This gigantic dam collects water from 35 glaciers. At 285 metres it is currently the 3rd highest dam in the world – a third higher than the Hoover Dam. It weighs more than the great Pyramid of Cheops. Details here. 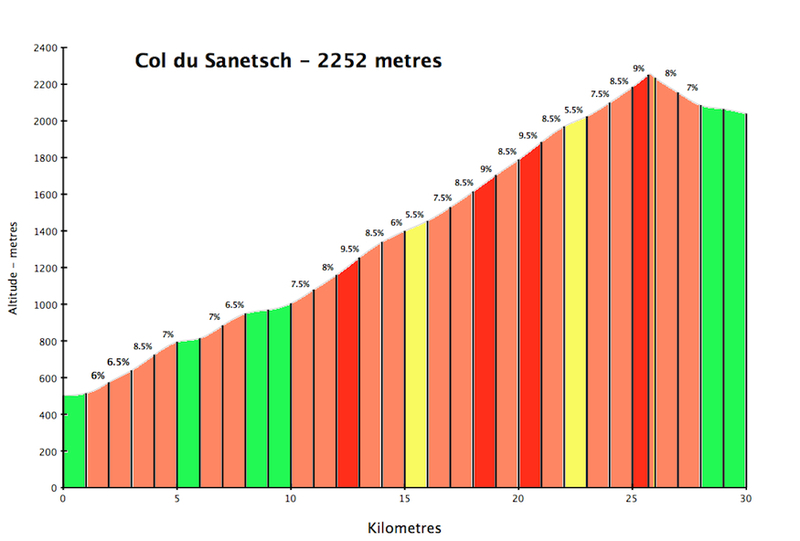 The huge climb over Col du Sanetsch to the lake is one of the very best climbs in Switzerland. A beautiful, quiet road – usually ignored by cyclotourists. There is only a road on the south side. But at the dam is a little cable car that will take bikes up/down the north side from near Gsteig. Eric once carried his bike up the trails here. Only recommended for the slightly crazy. Details here. I also cycled it when it was closed and covered in snow: Beautiful. 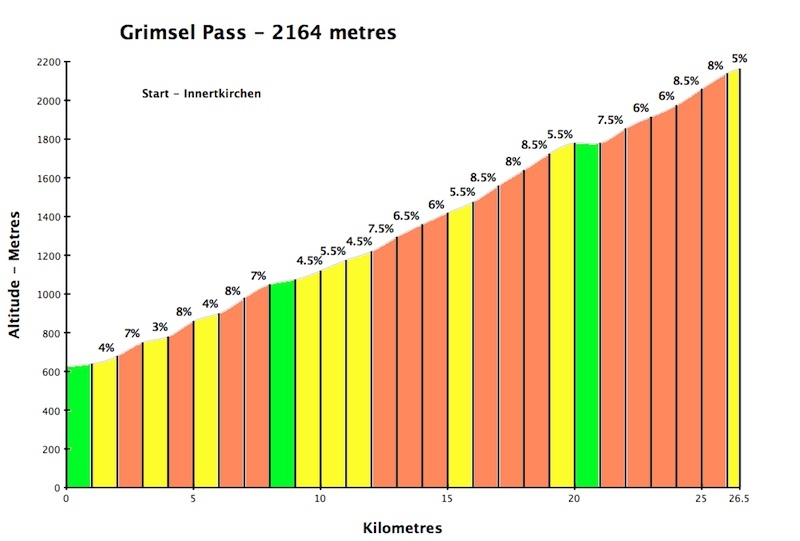 There are several dams near the top of Grimselpass. 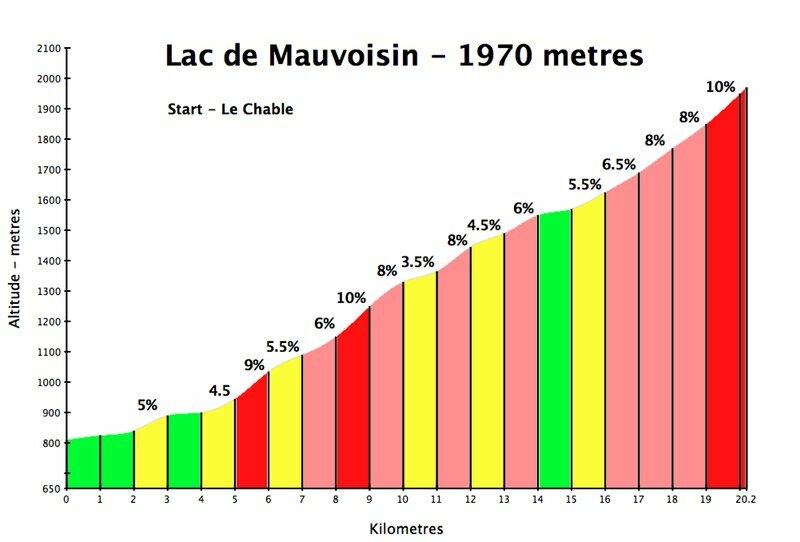 From the north, this climb is huge. From the south, the hairpins are unbelievable. Details of both sides here. 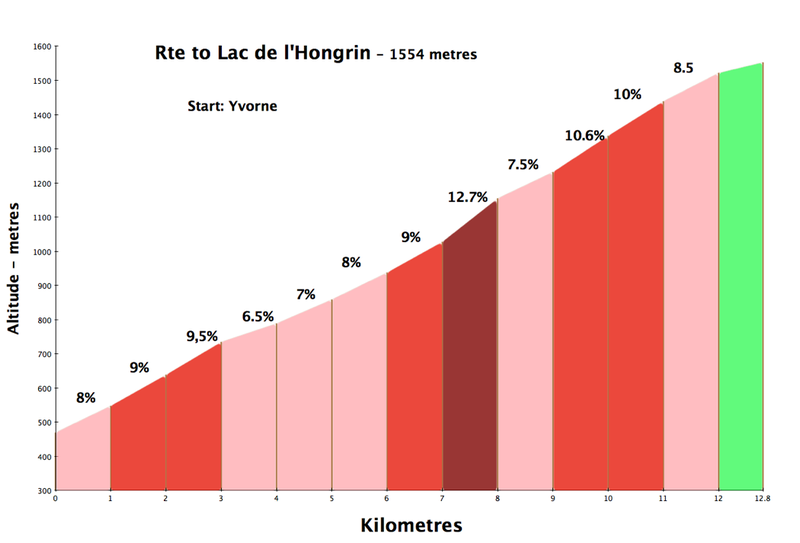 I also climbed it as part of the Alpenbrevet cyclosportive – see here. Another steep, beautiful, deserted road up to the 13th highest dam in the world. 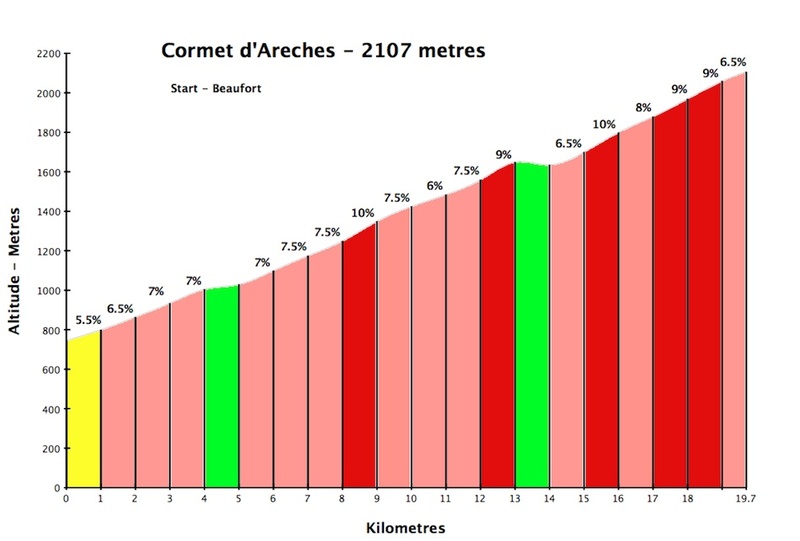 The start point is the same start point for Verbier and near the start for Col du Grand St. Bernard. See the video in the link: It’s necessary to brave a little tunnel to get up on top of the dam. Details here. 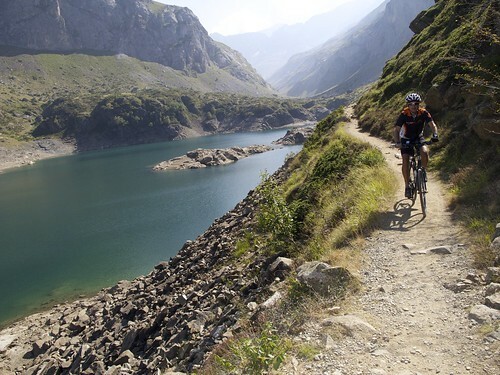 With a mountain bike, it is possible to go much higher past and above the lake – see here. This is my favourite paved route in the Pyrenées. 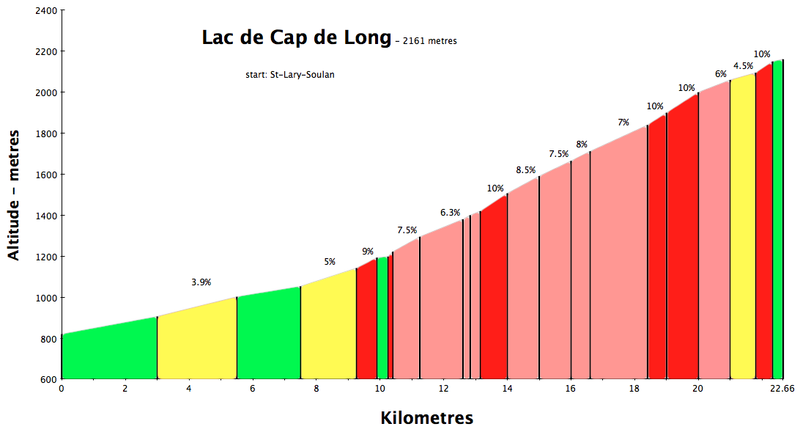 This lessor know climb in fact passes 5 Alpine dams/lakes including the fabulous Lac de Cap de Long. Truly amazing. 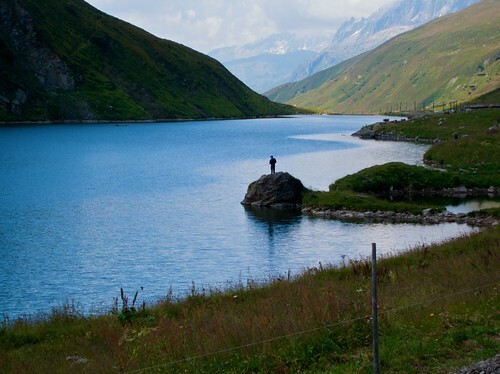 The beautiful Lac de Mont Cenis is entirely in France, but most of the gigantic south side climbs out of Italy. Col du Mont Cenis is situated just north of this beautiful lake. 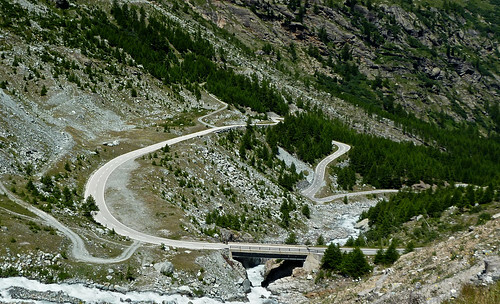 Don’t forget to take a 7 km detour on a beautiful little road to Col du Petit Mont Cenis. Details of both sides here. It’s also possible to do a loop around the lake (gravel on west side) – along with a detour searching for Hannibal – see here. 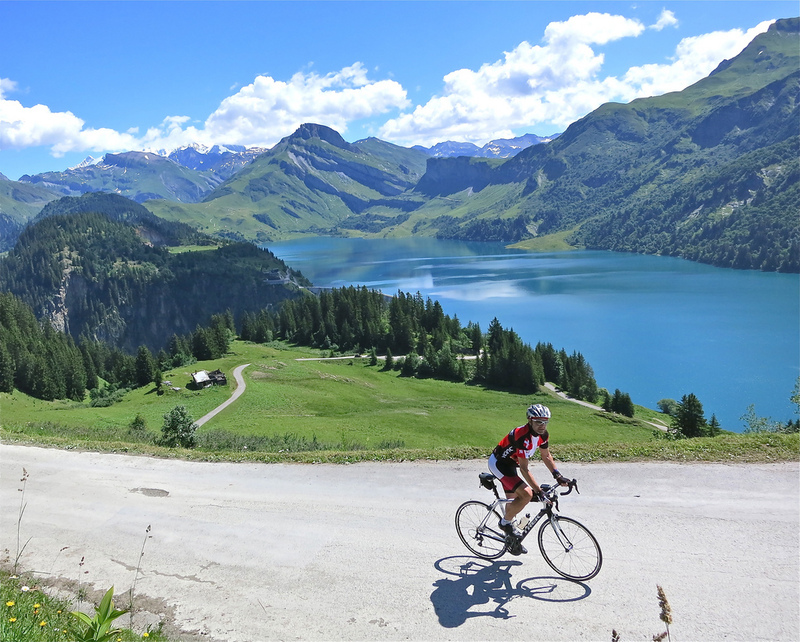 This large French lake is near the top of the legendary north side of Col de la Croix de Fer (and Glandon). It’s at the point where the roads finally gets a little less steep – so while participating in La Marmotte you can enjoy the views. Details of all 5 ways up Col de la Croix de Fer see here. 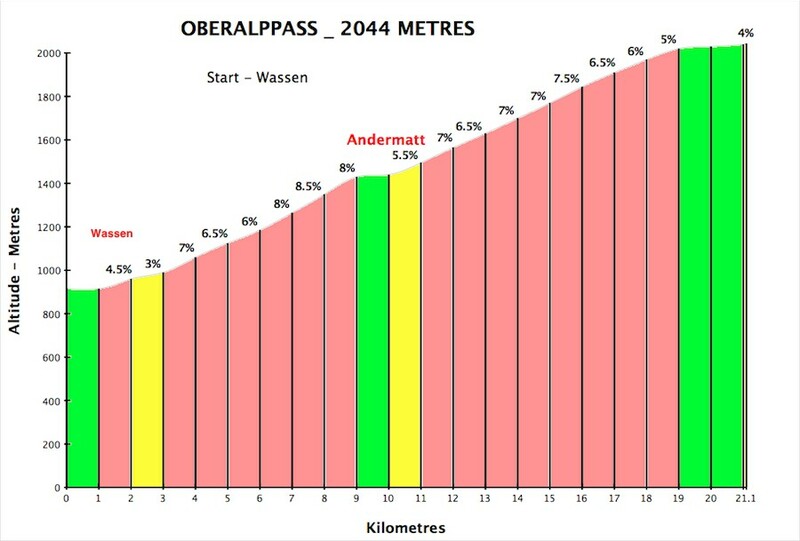 Oberalppass is not the hardest climb in the cycling Mecca region around Andermatt, but it is still over 2,000 metres and is certainly idyllic. It featured in the June 2010 Tour de Suisse and even has a train station at the top for the famed Glacier Express. Details here. 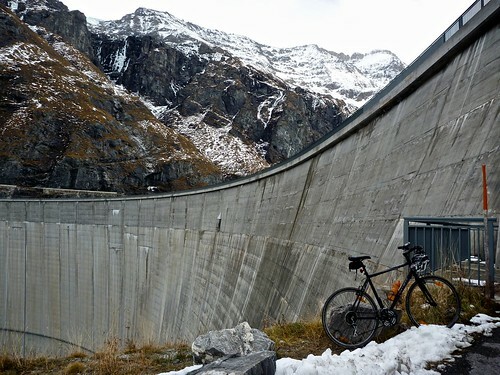 Another gigantic dam in the Swiss Valais. The first nine kilometres is the same road that leads to Zermatt and the Matterhorn, so there is some traffic. But once the route turns towards Saas Fee things get quieter. 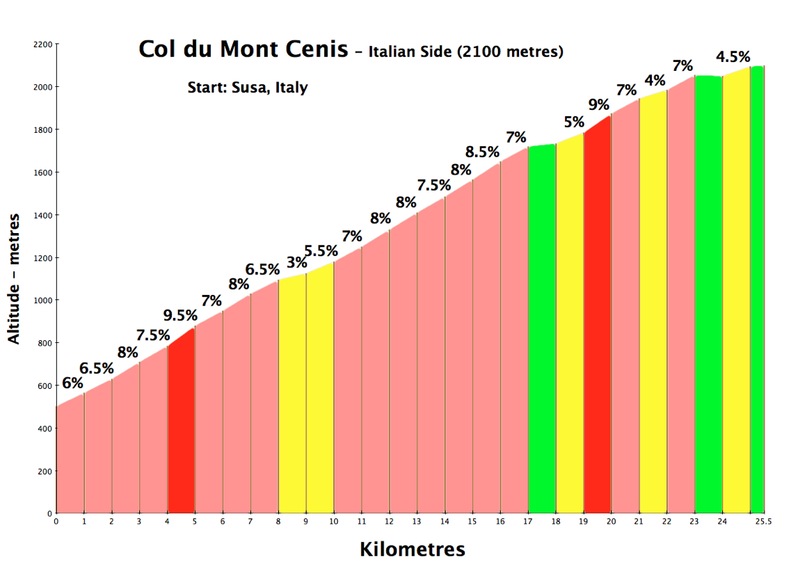 It’s not the hardest climb but 1580 metres of ascent is no joke. More details here. Again, a gigantic damn in the Swiss canton of Valais. The ascent to Lac de Moiry has to be one of the hardest of these alpine lake climbs. 2100 metres (7000 feet), hard work. I took the harder but quieter route via Vercorin – it adds 300 metres of climbing but has far less traffic. See the map for the easier route, which I used for the descent. More details here. 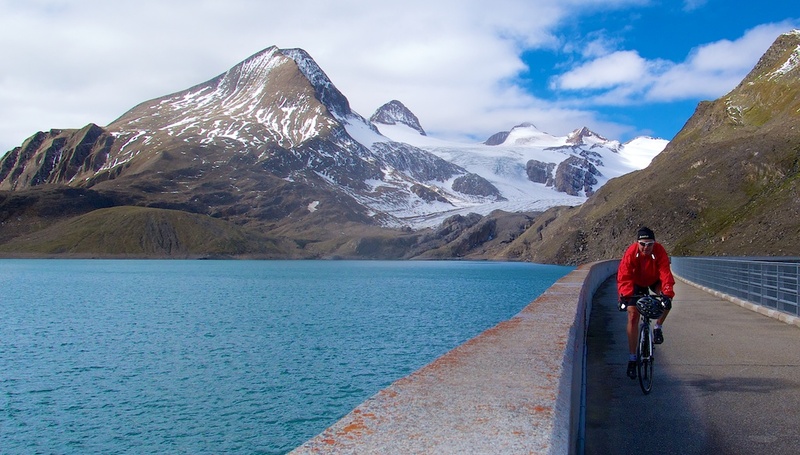 Beautiful vineyards, a challenging climb, a long tunnel, military checkpoints, an alpine dam/lake, and a beautiful castle – this loop has it all. And most of it is virtually deserted! Details here. 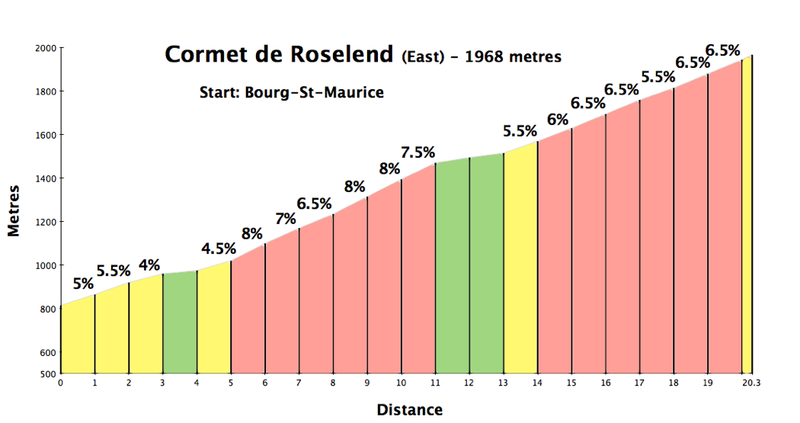 With the same start point as Roselend, this great route leads to a smaller, but very pretty dam / lake. 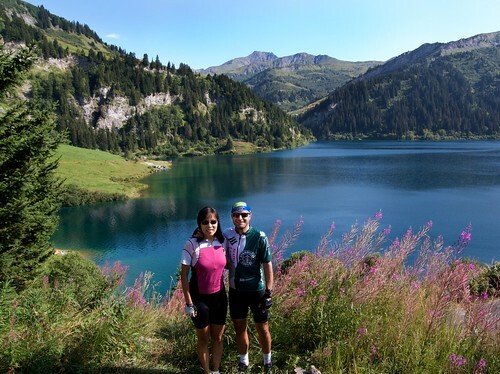 Stop for a drink to enjoy the view, but don’t stop, as this lake is only part way up the fantastic climb to Cormet d’Arèches. Details here. High in the Pyrenées above Gavarnie is a fabulous, deserted ride to Cirque de Troumouse. On the way down I made a small detour up to the dam at Lac des Gloriettes. Details here. A smaller dam in the Swiss Valais high above Sion. The climb starts through beautiful vineyards and finishes with a bunch of tunnels and the dam. 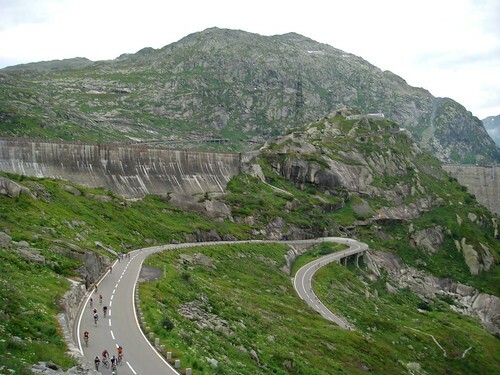 Starting from Aosta (Italy), this long ride starts in the same valley as the road to Col du Grand St. Bernard. The paved road ends at the dam. But there is a good quality gravel hiking trail / road that goes for several kilometres to the far end of this long, slim lake. Two high and beautiful dams in the Haute-Maurienne. Starting in Modane, there is a great quiet road that passes by several 19th century perched forts before heading up the ski slopes above Aussois to the dams. As is often the case, the paved road ends at the dams, but one can explore higher with a mountain bike. Details here. Another damn in the Val d’Aosta. Lago di Beauregard in Valgrisenche, Aosta, Italy is under repair through 2015, so the water levels are low. 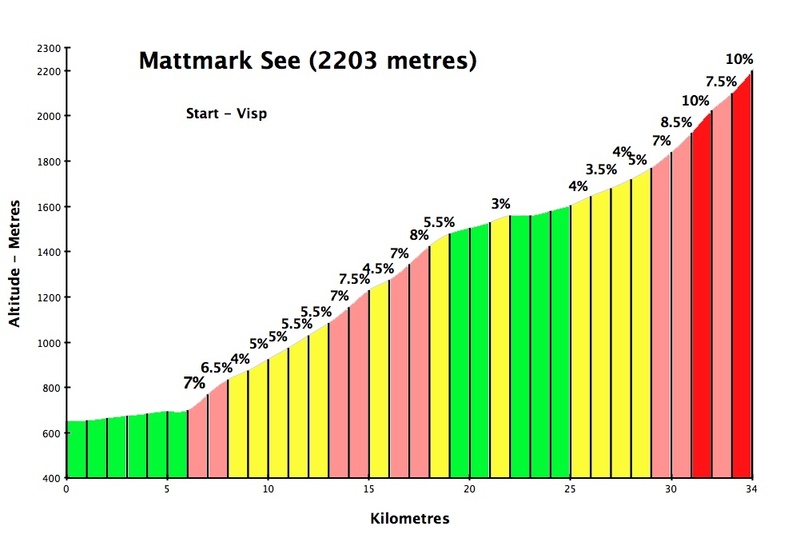 The paved climb is still quite interesting, reaching almost to 2000 metres – high above the lake. But there are a couple of great unpaved roads that allow one to go higher. Most of this ride requires a mountain bike. This ride actually starts at a lake. 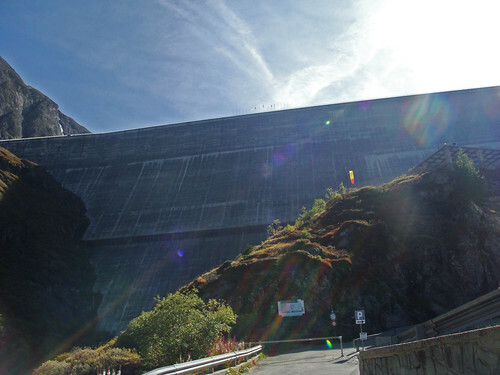 The giant dam/lac du Chevril on the main road that leads to Val d’Isère. 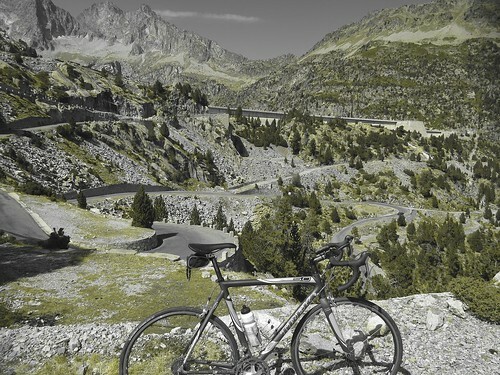 From here is a fantastic, little known paved road up to barrage du Saut – the 13th highest paved road in France. From this lake the paved road ends, but the fun starts. A superb, unpaved road up to the Dam/Lac de la Sassière. And from here, there is an old military trail that leads up to Col de la Bailleta (2852 metres). Plenty of snow even in July. Details here. Another unpaved climb. Starting in Beaufort, part way up the paved and beautiful climb to Col du Joly is a steep, gravel hairpin-filled deserted road up to Lac de la Girotte. At 2993 metres, this is one of the highest roads in Europe. Unpaved and bumpy, but fun. 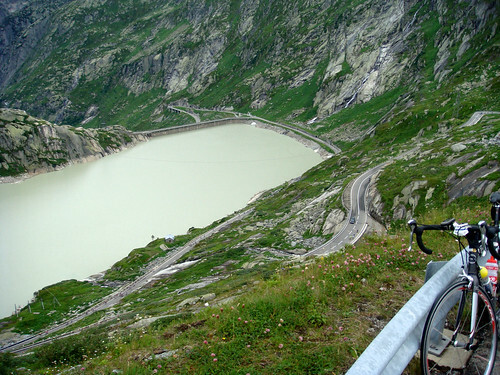 And as a bonus the route passes the Dam and Lake di Rochemolles at just under metres 2000 metres of altitude. Details here. 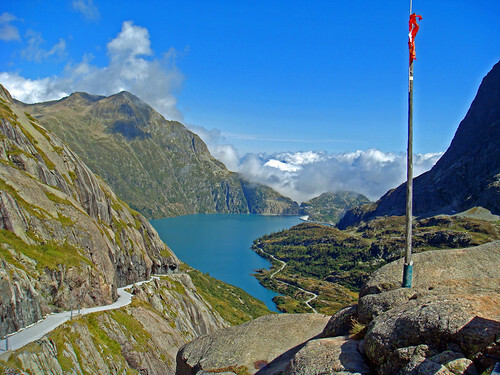 In Switzerland, il Lago di Santa Maria is at the summit of Passo del Lucomagno (Lukmanierpass) which separates Italian-speaking Ticino and German-speaking Grisson. Details here. Near the summit of the north side of Nufenenpass (the 2nd highest pass in Switzerland) is a little (paved) side road to the big Griessee dam. It’s worth the detour to see this lovely secluded lake and the Gries glacier high above. Details here. 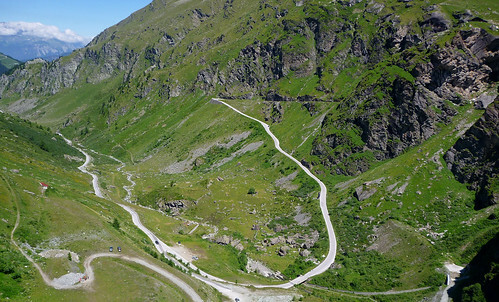 The old Tremola road up the south side of Passo San Gothhardo is one of the great rides in the Alps. But once you get to the summit, look off to the left and you will see the Lago di Lucendo dam. A fun little detour. Details here. 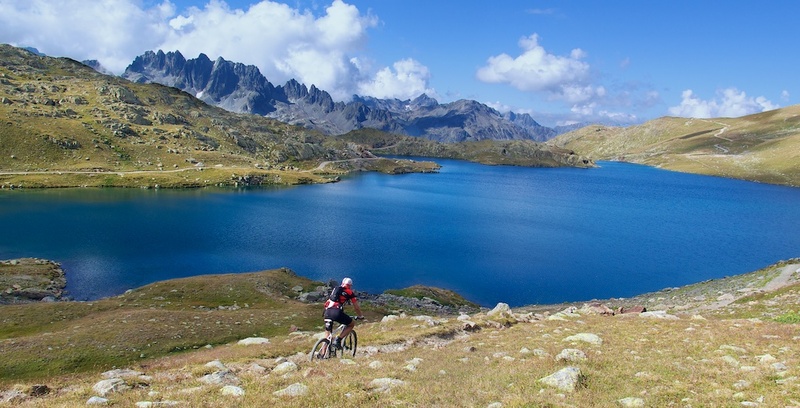 High above the legendary Col de la Croix de Fer are two beautiful lakes and a glacier — all recahable on mountain bike. There are a couple of small damns creating Lac Bramant. Amazing place – details here. I absolutely loved (LOVED) this huge climb hidden in the Swiss Alps above Locarno. 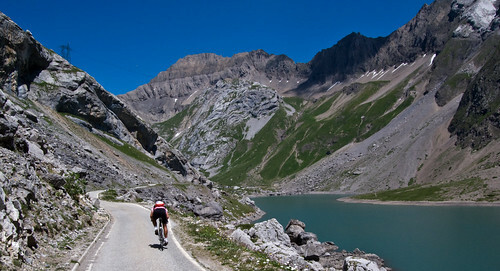 There are several lakes and dams along the route before reaching the double-dammed Lago di Narèt. Details here. This list is by no means even remotely comprehensive. 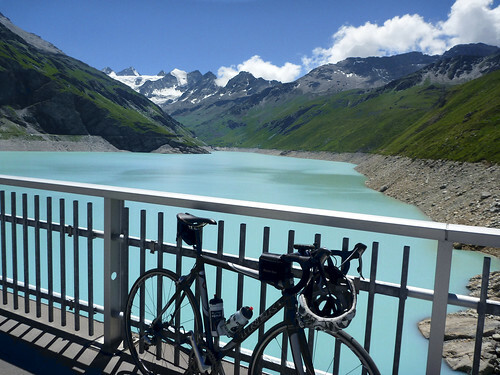 Feel free to suggest your favourite alpine lake /dam cycling climb. Map: Red = Switzerland; Green = Italy; Blue = France. 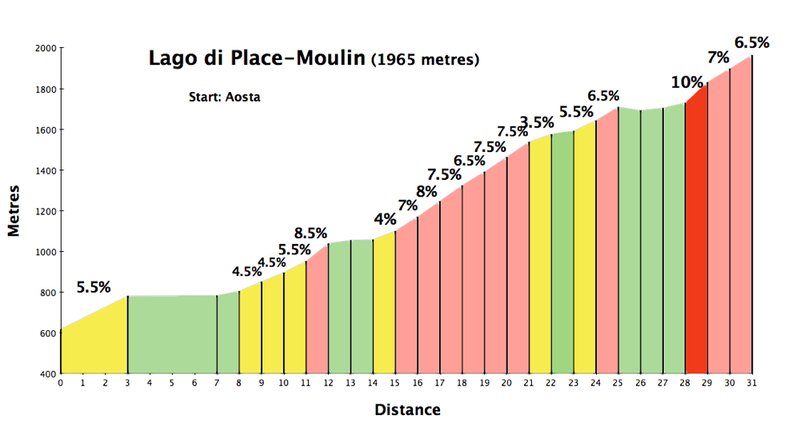 Yes, whenever the weather outlook is awful, I start dreaming about great climbs. Ah, c’est dommage. J’ai des amis qui sont en train de se noyer aux Pyrénnées. très bonne idée que cette sélection ! et ça m’en fait 9 à mettre sur ma liste ‘à faire’ !!! Philippe, tu as déjà fait ….. Lac de Grand Maison? Will, have you ever been to Lac Champex? 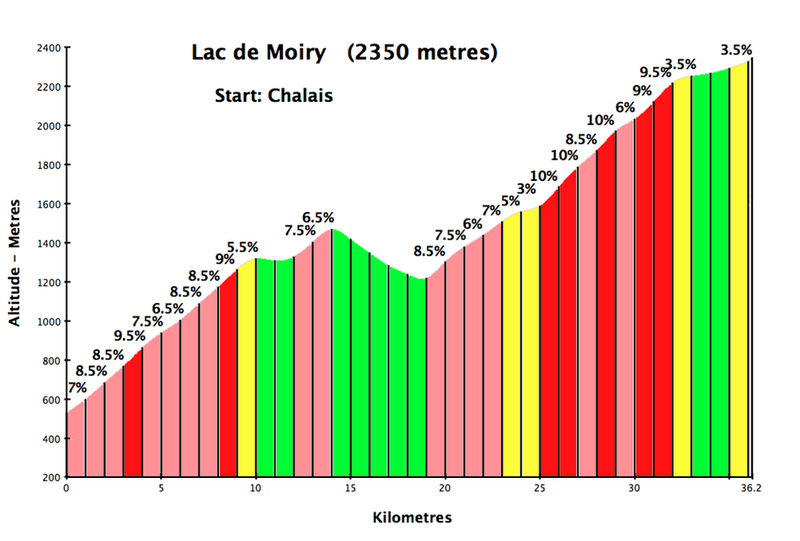 It’s a nice ascent via Martigny and a fast decent to Oursieres, from where you can either return to Martigny or proceed to Col de Grand St Bernard. 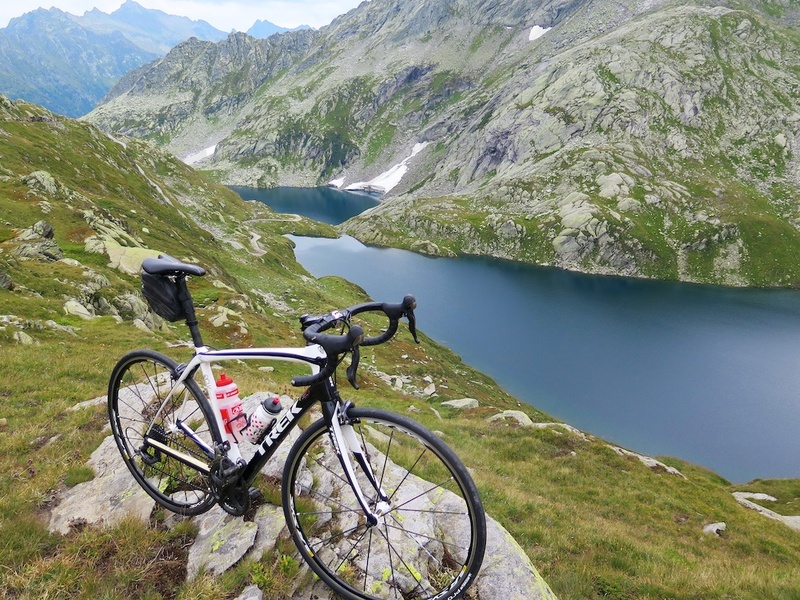 I visited the Lac d´Emosson twice this summer with the bike, which is absolutely stunning! 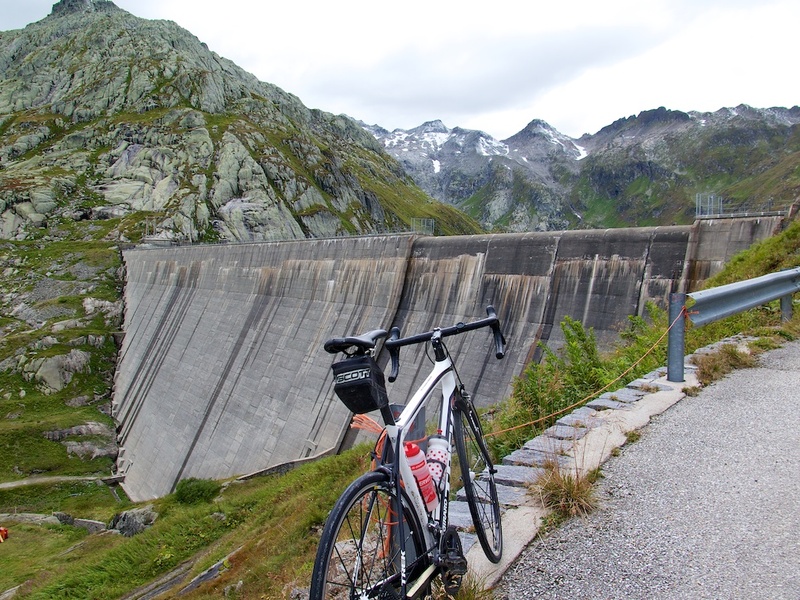 FYI: They closed the dam and particularly the other road up to the Vieux Lac d´Emosson. No, I have yet to do Champex. Many thanks for the suggestion. 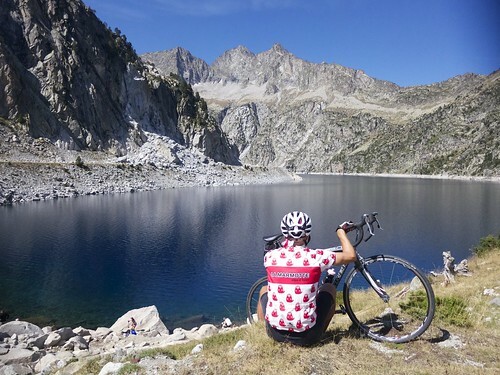 Will, as a fellow English speaking, uphill cycling expat in France, I’ve enjoyed your site for years and was delighted to see from your lake pictures that we ride the same model / color Madone. Not as grand as your top 12, but the Lac du Chambon on the way down the Lautaret is noteworthy, as is the Lac de Serre Poncon, although the latter admittedly isn’t a quiet high mountain lake like the others. thx very much for the note. 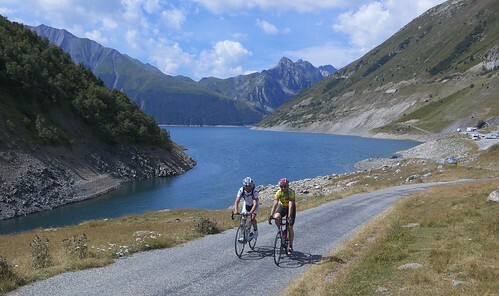 Lac de Serre Poncon looks like great cycling. 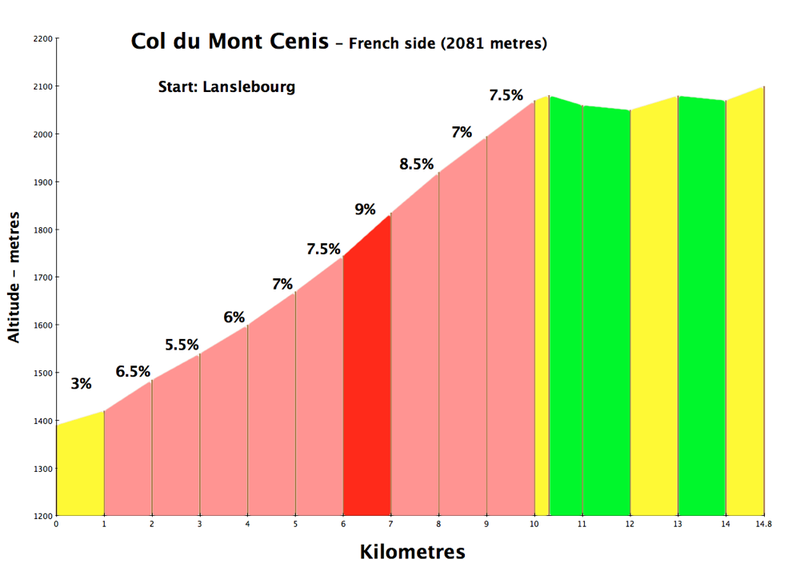 Our only time in the area, we did climb Col de Pontis https://www.cycling-challenge.com/tour-de-enfer-day-10-col-de-pontis/ which is steep, quiet and has nice views of the dam/lake. I’m a great fan of your blog as it’s my main source of inspiration for the discoveries of alpine climbs. 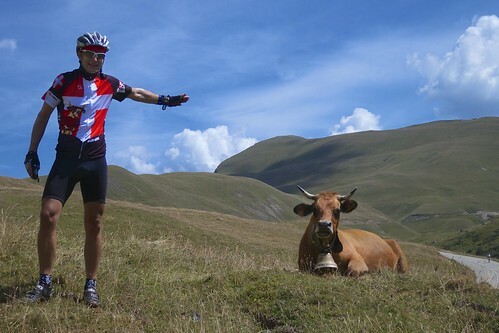 I live in Pays de Gex (Ornex) and cycle preferably in the Jura but also love to cycle in the Valais or the french alps. Last Monday I climbed Lac de Mauvoisin and even went through the tunnels on the west side of the lake to explore a bit the continuation of that road leading to Cabane de Chanrion, a project for next summer. 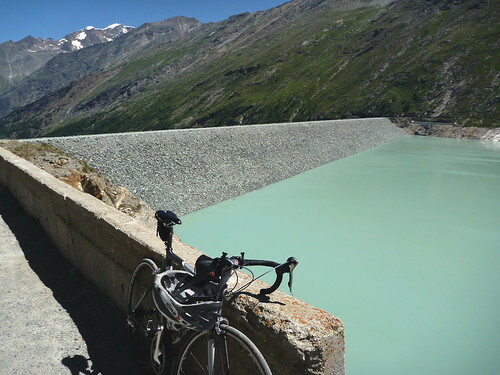 While checking the Valais for other lake climbs, I noticed a smaller dam north of Sion, called “Lac de Tseuzier”. 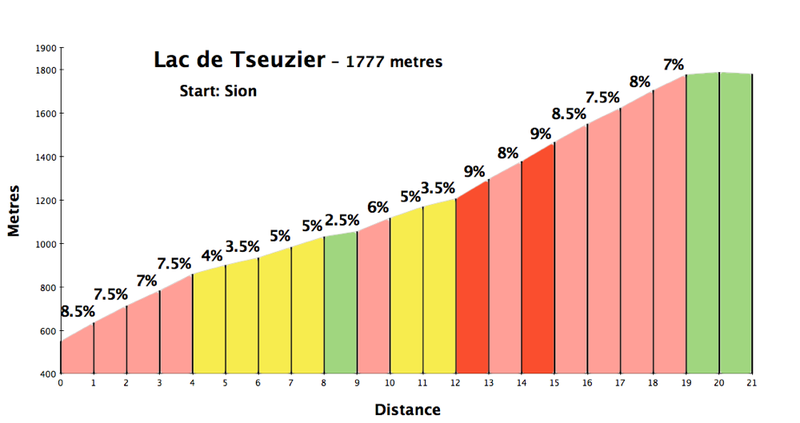 I have never been to Tseuzier, It’s on my list, glad to see that it is in fact do-able by bike. Drop me a line if you ride there. I would very much like to cycle with you one day but am afraid that I won’t be fast enough to be able to follow you. You must be super fit with all the outings you do. I’m currently in Bavaria (back to France tomorrow), but without any bicycle and just wait for the next nice day with decent temperatures to explore that ascent. I would probably choose the touring bike. Where do you live exactly (I suppose Geneva)? I will definitely let you know before going there and would be very happy if we could climb it together. Please send me a short email so that I have your address. I am currently struggling with a bad knee injury that just won’t heal. I wish you a good recovery and hope you’ll be fit again next year. If you want we could meet for a beer in Geneva. 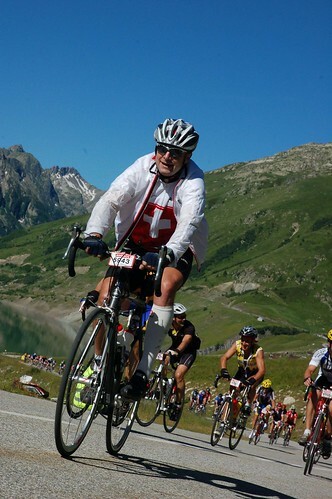 I’m so curious to talk to you about your cycling challenges!